Lang fixed tip retaining ring pliers are convertible for use on internal and external snap rings with cushioned grip handles. Lang fixed tip retaining ring pliers have a knurled center screw with spring for easy changing and secure hold. Lang fixed tip retaining ring pliers sets are packaged in a plastic blow molded case for protection and easy use. Lang Heavy Duty Snap Ring Pliers - Internal are designed with a spring ratchet locking mechanism that securely holds against snap ring tension. Optional .120'', 45° & 90° tips available (sold separately). Lang Heavy Duty Snap Ring Pliers - External are designed with a spring ratchet locking mechanism that securely holds against snap ring tension. Optional .120'', 45° & 90° tips available (sold separately). Lang 2 Piece Heavy Duty Snap Ring Pliers Set: Includes Lang 1485 and Lang 1486 are designed with a spring ratchet locking mechanism that securely holds against snap ring tension. Optional .120'', 45° & 90° tips available (sold separately). Lang Combination Internal/External Snap Ring Pliers 12 Piece Set. 0.038'', 0.047'', 0.070'' and 0.090''. tip diameter. 0°, 45° and 90° offsets. Lang Combination Internal/External Snap Ring Pliers 12 Piece Set. 0.038'', 0.047'' and 0.070''. tip diameter. 0° and 90° offsets. The 3492 Lang Fixed Tip Retaining Ring Pliers is one of thousands of quality tooling products available from MRO Tools. 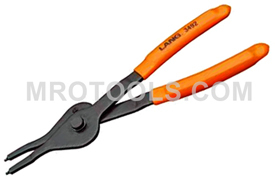 Please browse Lang Retaining Ring Pliers for tools similar to the 3492 Lang Fixed Tip Retaining Ring Pliers. 3492 Lang Fixed Tip Retaining Ring Pliers description summary: Lang Fixed Tip Retaining Ring Pliers. Technical Specifications Tip Diameter: .090'' Tip Angle: 0° Quantity discounts may be available for the 3492 Lang Fixed Tip Retaining Ring Pliers. Please contact MRO Tools for details.